Take a step into the shoes of Mr. William Roehm, a career ne’er-do-well and rogue. Join him as he leaps from one scrape to another – on the run from an encounter with an angry Baron, he comes to a seemingly sleepy little town in the valley. All is not as it appears, as he soon finds out on his Quest For Infamy. 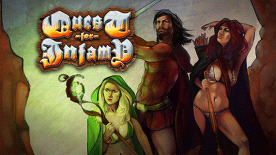 Quest For Infamy is a classic-style point and click adventure, where your actions, decisions and choices shape and form the game. Choose to follow the path of the rogue, brigand or sorcerer – and get a different experience each time. Using traditional elements from Role Playing Games and Adventure Games, Quest For Infamy harkens back to the classic days of PC gaming – bringing you a new experience with a familiar old feel.